I recently found French Inspired Jewelry, creating with vintage beads, buttons and baubles on the local book sellers shelf. It was a "must have" for my collection. Kaari Meng, it's author, has been designing jewelry for more than 20 years using vintage glass beads that she has hunted for all over the world. Her jewelry has grown from her love of those beautiful bits and pieces of the past. French Inspired Jewelry is beautifully illustrated. The entire book has a vintage feel to it. You can be inspired just slowly turning the pages and looking at it's photographs of beautiful jewelry displayed with vintage ephemera. The book is worth having for the artwork alone, but don't stop there. 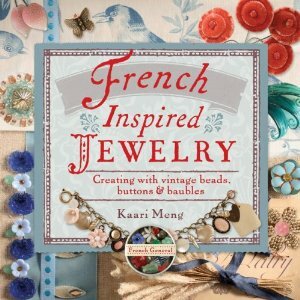 French Inspired jewelry contains a wealth of knowledge and helpful hints from an artist that has learned them through experience. Kaari's Basics chapter has the usual discussions of tools, findings, stringing supplies and techniques. The treasure of this section is the description of glass beads written by someone that values them. Mass produced glass beads are often overlooked and even disparaged by jewelry designers. Here they are celebrated for their unique beauty and old world charm. The remaining chapters contain projects. Some are standard and some unique. All are beautiful. My favorite part? They are presented according to a specific palette. This author makes me want to sort my beads by color! La Mer shows a love of the Mediterranean Sea represented by turquoise blue, coral and white. Le Marche shares the beauty of fresh fruits and bright flower blossoms. Le Cirque is a riot of color. La Volie're, Le Vigne and Le Jardin rejoice in bold and natural pigments. The designs laid out in Le Chateau are worthy of French atistocracy. Please don't think me morbid but my favorite chapter is the last, La Cimetiere. The jewelry designs pictured there share a subdued monochromatic palette that is soft and pleasing to the eye. The use of vintage religious medals in this chapter gave me the courage to dig out the ones that I had been saving and to use them in charm bracelets of my own. Every chapter of French Inspired Jewelry has design tips from how to clean old glass and millinary supplies, to setting up your workspace. The author is generous in her descriptions of favorite materials and how to find them. I somehow think that for Kaari Meng that search is an enjoyable adventure. The topic of Book Reviews was chosen as the Starving Artists Team's Blog Carnival post for the month of November. Read how other members felt about the subject. I'm not sure I like this book review topic... I want all the books! This one sounds really interesting! I love going into yarn shops that sort on colour not on yarn types, I have all my seed beads sorted in trays of colour rather than size. Will have to keep my eyes open for this book! A very interesting book and you're mention of the last chapter is one that captures my attention. Certainly one to add to the wish list. Although I don't design in a vintage style, your description of this book makes it seem very intriguing. I will look for it at my local bookstore. Felix or Oscar What is your work style?